CONTENTS ONLY A must have general first aid kit for the house, workplace, caravan, work or other off-road and remote situations. This comprehensive kit includes all the essential items listed by the National Safe Work Australia Code for all workplaces across all Australian States including Outdoor, Remote and Burn Modules, plus 19 listed items and all optional inclusions as documented by Standards Aust Class A Kit AS2675. This kit also contains other items that will meet diverse as well as recurring first aid situations in the home and when away from home in off-road situations. Businesses, farms and other organizations would be wise to have a kit like this on their premises in case of the unexpected. Can you demonstrate your duty of care otherwise? 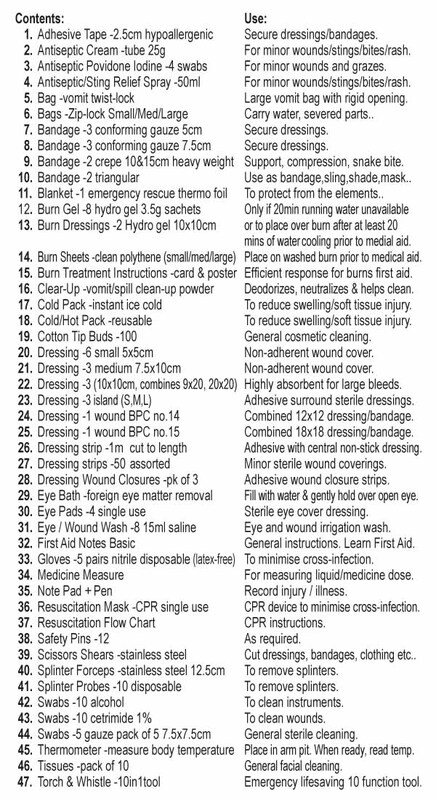 This contents pack can be ordered with any larger first aid container (order it separately) and we'll pack it for free. 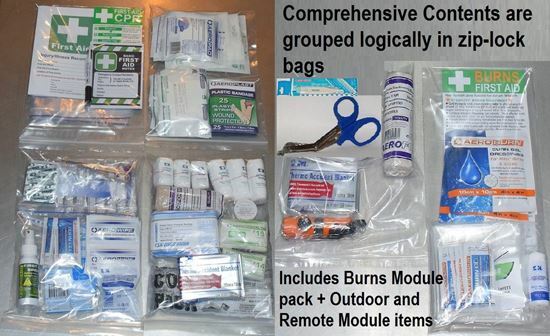 A must have general first aid kit for the house, workplace, caravan or other off-road and remote situations. This comprehensive kit includes all the essential items listed by the National Safe Work Australia Code for all workplaces across all Australian States including Outdoor, Remote and Burn Modules, plus 19 listed items and all optional inclusions as documented by Standards Aust Class A Kit AS2675. This kit also contains other items that will meet diverse as well as recurring first aid situations in the home and when away from home in off-road situations. Businesses, farms and other organizations would be wise to have a kit like this on their premises in case of the unexpected. Can you demonstrate your duty of care otherwise?